The ToughBuilt Project Pouch with Hammer Loop transforms how professionals carry tools. The patented ClipTech Hub allows the pouch to clip on and off any belt so it is carried only when it is needed or when it is the only thing you need. Its 6 pockets and loops including a high capacity pocket with No-Snag Hidden Seam construction and extreme-duty hammer loop make it perfect for smaller jobs. Works great alone, or enhances any toolbelt. With rugged 6-Layer Construction and heavy-duty rivet reinforcement this reliable pouch withstands the most rigorous working conditions. 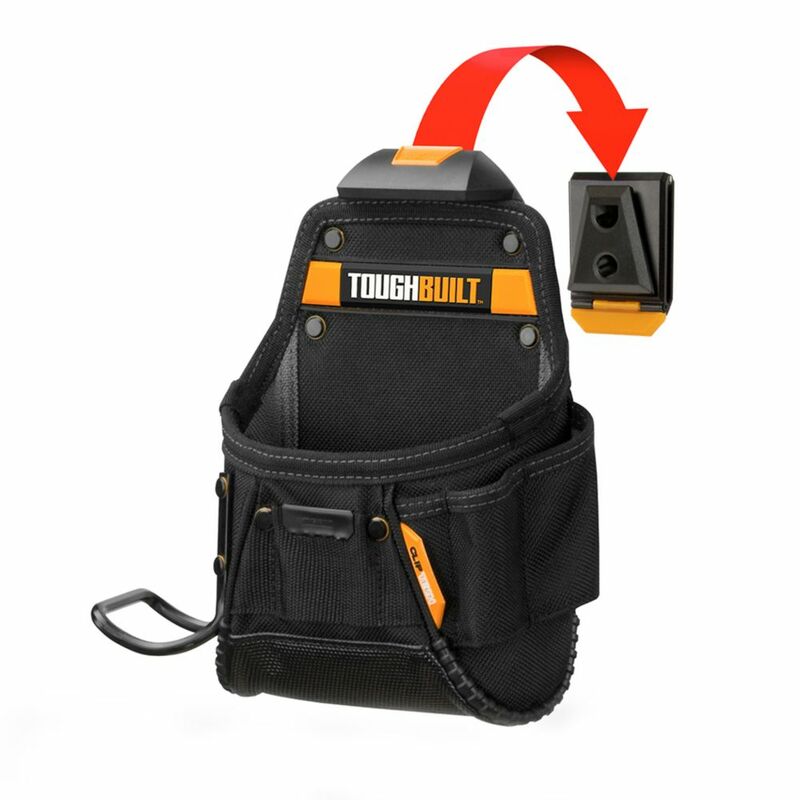 The ToughBuilt 4-piece Contractor Tool Belt Set brings a new level of organization and efficiency to every project. The ClipTech innovation gives professionals the never-before option of effortless, adjustable, and interchangeable pouches to fit every job. Carry only what you need, when you need it. This set includes 3 rugged pouches and Padded Belt with heavy-duty buckle. Integrated kickstands allow your pouches and tools to stand on the floor or table next to you. Its 36 customized pockets and loops include 6 large-capacity pockets with No-Snag Hidden Seam construction, notebook pocket, speed square pocket, separate tape measure pouch, extreme-duty hammer loop, and 2 tape measure clips. Made with rugged 6-Layer Construction and rivet reinforcement, this dependable tool belt withstands the harshest working conditions. The ToughBuilt 8 inch Tote + Universal Pouch with ClipTech is an ideal set for DIYers and service professionals alike. The ClipTech innovation gives professionals the never-before option to effortlessly adjust and interchange pouches. The Universal Pouch quickly clips onto any belt and onto the tote itself, efficiently adapting to every job at hand. Its 31 pockets include structured external pockets that flex to securely hold tools in place and internal dividers to keep everything organized. It features a quick release handle for superior visibility and accessibility. Made with high-quality rugged materials, heavy-duty rivet reinforcement and high-impact clawed rubber feet this hard-working combo keeps up with the most rigorous demands. Project Pouch / Hammer Loop The ToughBuilt Project Pouch with Hammer Loop transforms how professionals carry tools. The patented ClipTech Hub allows the pouch to clip on and off any belt so it is carried only when it is needed or when it is the only thing you need. Its 6 pockets and loops including a high capacity pocket with No-Snag Hidden Seam construction and extreme-duty hammer loop make it perfect for smaller jobs. Works great alone, or enhances any toolbelt. With rugged 6-Layer Construction and heavy-duty rivet reinforcement this reliable pouch withstands the most rigorous working conditions. Project Pouch / Hammer Loop is rated 4.8 out of 5 by 19. Rated 5 out of 5 by CJ from Perfect pouch for the "honey-do" list. Just enough space to store what I need and not so much tha... Perfect pouch for the "honey-do" list. Just enough space to store what I need and not so much that I have to carry a heavy, bulky belt around bouncing off of every wall in the house. I love the toughbuilt system as well. Was really apprehensive about the interchangeable clips, but they have worked amazingly and hold up great. Seems like every time I turn around I either have too much storage or not enough on my belt, so I just swap a pouch here and a holster there and boom, back to work. Can't recommend highly enough! Rated 5 out of 5 by Adam from great small bag , fits great on my tool belt.... great small bag , fits great on my tool belt.